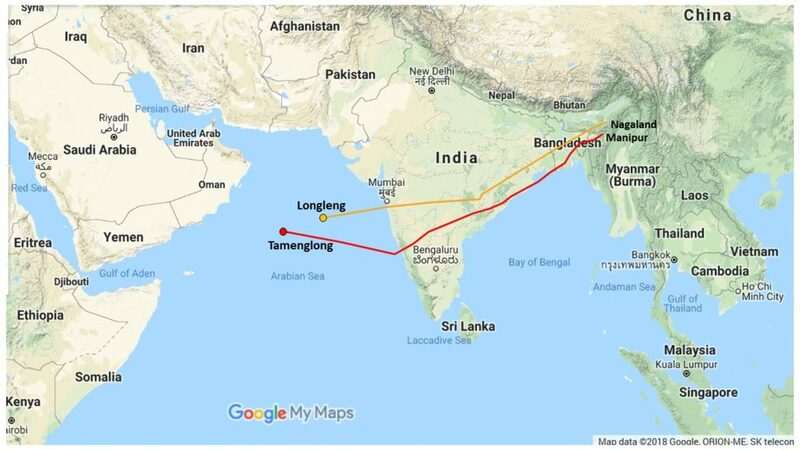 Two satellite-tagged female Amur falcons ‘Longleng’ and ‘Tamenglong’, eponymously named after two districts of the north-eastern states of Manipur and Nagaland, started their incredible migration journey from their roosting sites in the region, according to Dr Suresh Kumar, Scientist of Wildlife Institute of India, Dehradun. ‘Tamenglong’ tagged for the first time along with ‘Manipur’, a male bird at a roosting site at Chiuluan village in Tamenglong district of Manipur started its non-stop five days migratory journey from Manipur on November 19 and has now covered 3500 km while ‘Longleng’ which was tagged at a roost site in Yaongyimchen village in Longleng district of Nagaland on October 30, 2016 is also now following ‘Tamenglong’ and covered about 3000 km after it left Assam-Meghalaya border on November 19. Unfortunately ‘Manipur’ was killed by unidentified miscreants few days after they were released in wild on November 9 last. It is also equally important for the biologist and common people to understand the birds which are one of the biological indicators. Amur falcons (Falco amurensis) which are one of the least known birds among 69 falcon species are known to breed in southeast Russia and northern China and migrate to west through India and across Arabian sea to southern Africa, making a round-trip of at least 20,000 km annually. In their journey, these pigeon-sized birds arrive in large numbers during October in Nagaland and Manipur besides few places in northeast India and leave the region in November after eating enough food for non-stop flight to Africa where they spend their winter. “They visited the northeast routinely because they know the availability of food in the region even though they pass through Indian sub-continent during the journey,” the scientist felt. These birds feed on flying termites and insects etc. Dr Suresh also lauded the activities of the people in Tamenglong and Noney besides the people in Nagaland’s Longleng and Wokha for their tireless effort for taking up certain conservation activities of the wildlife in the region. It may be noted that Rainforest Club Tamenglong and State Forest Department has been observing Amur Falcon festival in November annually since 2015 to spread awareness about the bird among the masses.